When people talk of art you just never know what you are going to hear next – it is exciting, thought provoking and often moving and I hoped that my meeting with local artist, author and tutor Cas Holmes would prove to be as inspiring as her work. I was not disappointed. Cas has many layers to her work and if I, a lay person, were to describe her style, it would be ‘life reassembled seen through fresh eyes’ Cas has been ‘reassembling’ art since she had a ‘light-bulb moment’ in the first year of college. Cas was given a horrible cream canvas to transform. She got a knife and cut through the canvas, changing the structure and this was a catalyst for her artistic style. Cas’s work is multi layered, textured pieces of art within the disciplines of painting, textile and drawing and she finds inspiration in salvaged materials which she tears, cuts and reassembles creating mixed media artwork to capture the moments of everyday life that are overlooked before they are lost forever. 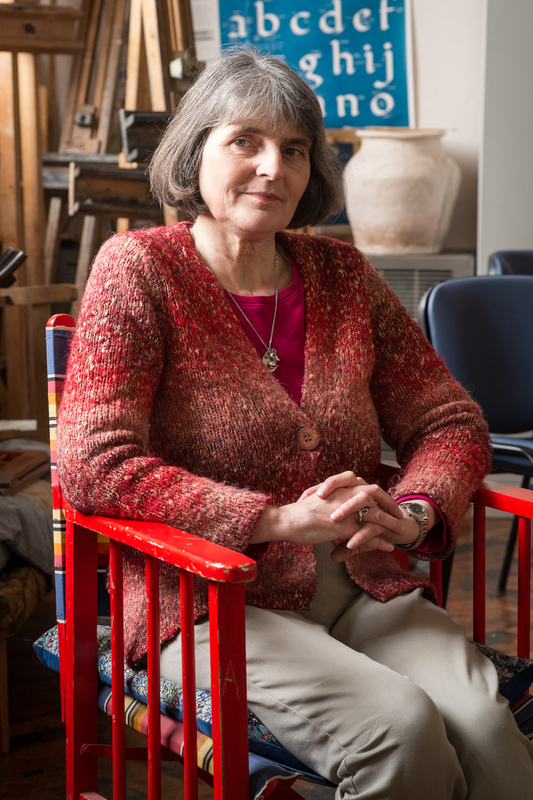 Maidstone based, Cas is a world renowned artist with her artwork represented in major collections including the Museum of Art and Design New York, the Embroiderers Guild and Arts Council England. Invited as a guest artist at the European Patchwork 20th Anniversary, Cas’s work is highly regarded and after our meeting she is jetting off to the USA to hold workshops in Atlanta, Phoenix and San Diego. Fine Arts trained, Cas’s eye for seeing the little details around her in life has been with her as far back as she can remember. Cas tells me of a childhood growing up in Norfolk with a family who tended to ‘look at things differently’. She remembers collecting cobwebs and had the freedom to play outside and she is sure that the sense of play has never left her. “My father was a painter and decorator with an enquiring mind who thought education wasn’t necessarily in an institution” cas confides as she recalls a happy childhood and also links her love of the outside to her Romany grandmother who lived in a gypsy caravan. Community is all important to Cas and gives her inspiration. She worked in community arts when she left college and it makes sense to her that she now works with Adult Education as a lecturer and works with schools as a preferred artist invited in to give talks to the students. She is also involved in a lot of charity work and is a keen supporter of the organisation ‘Plantlife’. Cas also did volunteer work in a local hospital and in doing so connected art to people and the Oncology ward in Maidstone hospital is testament to this as they still have one of Cas’s pieces of work. This part of her work seems to nourish her as an artist. She loves recycling, being a staunch supporter of reusing fabric and material but even though Cas knows a good piece of material when she sees one, she claims that she never knows where a piece of work is going to take her “I plough on regardless – if I knew where it was going I wouldn’t start it!” Cas explains. 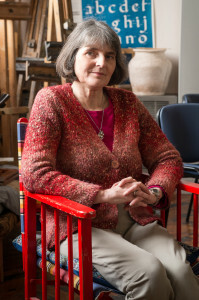 Cas completed her Fine Art degree in 1983 and then studied paper in Japan thanks to the Winston Churchill fellowship and realised paper and cloth connected through art in a way she found interesting. Cas is freelance you can commission pieces that cost anything between £50 to £10,000 depending on the scale, time and the detail that is involved. She makes pieces for public and private spaces, free hanging mixed media textiles, as well as smaller be-spoke works and objects for gifts and special events. Putting a price on artwork is always a tricky situation and we talked about the business side of being an artist “any business centres around my art, not the art around business” Cas declares and it is true that making a living from art is almost contradictive. Creating art which is so free and individual must be impossible to price. Her work is more about beginnings than endings. Cas is forever collecting – any fabric or material she finds goes into her work and currently Cas is working on a project about creating artwork from anything you can find within ‘40 Yards’ of home. It’s an interesting concept and links in with Cas’s love of outdoors and preserving the environment. Another current textile project is ‘Tea-Flora Tales’ which stitches together hundreds of peoples art textile contributions telling their own little ‘tale’ stitched together to make a daisy chain piece of installation art which is touring Britain and soon in Europe. ‘Tea-Flora Tales’ started life at the Knitting and Stitching Show, but now Cas adds pieces received in the post and given to her by people she meets. Anyone can contribute to Tea-Flora Tales by painting or drawing an image on a piece of watercolour paper or back of postcard and/or combine it with a textile piece. Use a piece of paper with text on it (magazine for example) or a postcard from your travels (the end piece no more than a postcard in size but can be smaller) take a dried teabag or a wrapper from a herbal or fruit teabag, add a floral piece of textile and whatever else you want to add either stitched or glued together and send it to Cas (see details at the end of the article). Cas has been interviewed and asked about her work numerous times and one of the touching things about Cas is her motivation to tell her story and the stories of her art. This passion must be infectious when she is teaching and she is getting her stories told to as many people as possible through not only her artwork but also her books. So far, Cas has written three books with the second as a collaboration with Anne Kelly. Her first book, ‘The found Object in Textile Art’ (2010) Cas views as a seminal book covering some of her early work but was predominantly about helping other people use the materials they have around them. The second book, ‘Connected Cloth: Creating Collaborative Textile Projects’ (2013) hones in on the increasing trend of collaborative projects giving advice and insights into art collaboration based on personal experience and the last of the three titles, ‘Stitch Stories’ is Cas’s current project. Textile work in general is very visual – you can see the textures, the 3D nature of fabric and every stitch creates a new story and Cas points out: “…cloth has a memory – wedding dresses, children’s clothes, handkerchiefs for loved ones in the first world war, we use it [textile] in a far from ordinary way.” Every piece of textile tells a story and it is the story of each piece of textile, and the art which she creates from them, that Cas holds dearly; “…really what is important is the stories that come out of textiles and the handling of them.” Cas surmises. As an artist Cas uses any materials to hand and even liberates skips of materials she may use – saving them from a landfill fate. If Cas had to choose one thing she couldn’t do without she would choose to have a stack of very sharp needles so she could sew anything she found around her and one of the brilliant pros about Cas’s type of art is that it is ‘portable art’ meaning she can take her art with her and add to it whenever she likes. Cas has a work space at home and claims the most important thing about her workspace is storage! For someone who is forever collecting materials storage is paramount. Cas is fascinated in urban nature and is currently working on more pieces revolving around this concept. Cas has just finished a successful show at the Beaney Museum and Art Gallery in Canterbury and is a guest exhibitor at the European Patchwork Meeting this September as well as having exhibitions in France, Germany and the Netherlands in 2014. There is no doubting Cas’s artistic prowess and I am impressed with how she is taking her message to the world – workshops in Australia, exhibitions in Europe and tutorials in the USA. Although the textile industry in Maidstone is nowhere near the large scale economy driver it once was, it is good good to know Maidstone is still going strong on the textile export front –thanks to Cas Holmes! Cas Holmes brings inspiration down to earth where each or us can grab hold of it anytime, anywhere, if we are of the mind to be open to everything around us…the most familiar, the most ordinary, and how it all is really extraordinary…the pure, joyful,simplicity of it all. Cas Holmes has a down-to-earth approach to life and her art takes her on flights of fancy, which evoke folk cultures, traditions and mythology with an abandon which ignores all barriers. Sometimes figurative, sometimes wholly abstract she has an unerring faith in her feeling for her materials. Confidence pours from her work and with it a power and sophistication that brings to it an almost religious sensation of ancient wisdom revisited. Her work is inevitably influenced by her visits to Japan but more as someone who would use that influence to reaffirm her own strengths. That is her originality Her materials are overwhelmingly organic and appear to have been given new life. Paper ages and crinkles with a will of its own and is made exquisitely into a Japanese style panels allowing light to pass through, or are incorporated into one of her unique quilted hangings. Behind it all there is a sense of grand design under the control of the artist. It is both decorative and rich in symbolism.A sense of provocation displays her commitment to art as part of life and shows richly in her dedication to community projects into which she throws herself like an avenging demon.